IWMW 2018 Open For Booking! Brian Kelly and Claire Gibbons, the co-chairs of the IWMW 2018 event are pleased to announce that the IWMW 2018 event is now open for bookings. 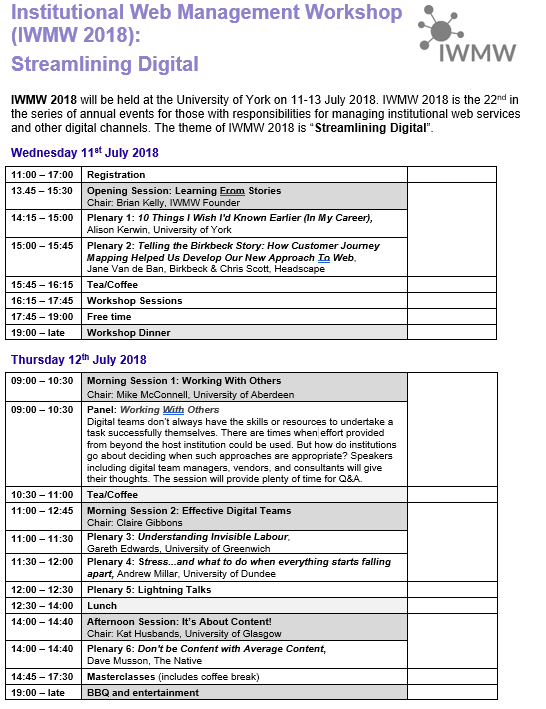 The IWMW 2018 event, the premier conference for those working in institutional web and digital teams in thew UK’s higher education community, will be held at the University of York on 11-13 July 2018. We are pleased to have frozen the price of the 3-day event at £400 which includes entrance to the event and social events, lunch and refreshments and 2 nights’ accommodation. For those who do not require accommodation the price is £330. Discounts are provided for speakers and facilitators of the parallel sessions. In addition there are also bulk discounts for institutions which make a booking of 5 or more delegates in a single booking. The programme is available on the IWMW 2018 web site. In brief the event comprises a number of plenary talks and other plenary sessions (which provide a shared experience for all delegates), together with a series of parallel workshop sessions and master classes. 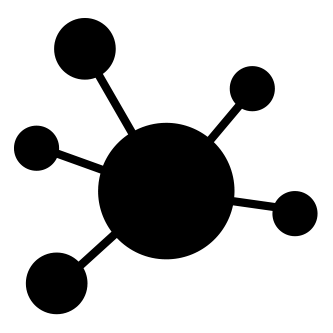 The theme of the IWMW 2018 event is “Streamlining Digital” and the plenary talks, in particular, explore ways in which institutional digital teams can respond to the many challenges which the higher education community currently face, whilst still continuing to provide mission-critical services and continue to innovate. The opening day begins with a session entitled “Learning From Stories” which features two speakers who share their personal and institutional stories. Alison Kerwin, Director of Marketing at the University of York who leads a 40+ strong digital, content, creative, strategy and insight team opens the event. Alison, who has given plenary talks at IWMW 2007 (coincidentally at event also hosted at the University of York, when she was head of digital at Edge Hill University) and in 2008 (as head of digital at the University of Bath) has described how her “passion for digital remains but in recent years her focus has expanded to include championing the institutional brand, managing print as well as digital, balancing student recruitment with research and internal communications, and much more besides“. After an absence from the event In the opening plenary talk entitled “10 Things I Wish I’d Known Earlier (In My Career)” she will reflect on her career and roles at three very different institutions and share the knocks and triumphs, both personal and professional, that she has experienced along the way. The plenary sessions on the second day address two different aspects of streamlining digital.In a session on “Effective Digital Teams” we will hear Gareth Edwards, University of Greenwich reminding delegates of the importance of “Understanding Invisible Labour“: resolving the tensions between the need to deliver more sophisticated, audience-focused experiences whilst also being under pressure to reduce overheads and devolve control by recognising and managing the hidden micro-tasks that fall between the gaps. The afternoon of the second day features a special invited speaker in a session on “It’s About Content!” with Dave Musson of The Native giving an unambiguous message to delegates: “Don’t be Content with Average Content“. The final day of the event provides an opportunity to hear a number of “Institutional Case Studies“. We currently have two confirmed talks in this session, with Ayala Gordon, University of Southampton & Padma Gillen, Scroll talking about “User Needs, Content Design and Culture Change: Digital Transformation at the University of Southampton” followed by Fraser Smith & Megan McFarlane, University of Aberdeen on “Student Recruitment Enquiries in CRM“. After the coffee break on the final morning delegates have the opportunity for “Revisiting Content” in which Jenni Taylor, Cardiff University will be “Resurrecting the Content King“. The event concludes with a session on “Looking To The Future“. Plenary talks have featured at all of the previous 21 IWMW events. However this year we are featuring two special plenary sessions. The “Lightning Talks” session provides an opportunity for all interested delegates to give a brief talk to their peers on a topic of particular interest to them. The IWMW 2018 advisory group is currently finalising the guidelines for this session: should this be a “minute madness” (as librarians demonstrated a few years ago) or provide delegates with the opportunity for a more leisurely 3 or 5 minute lightning talks and how should the session chair handle speakers who fail to stick to the deadline (a water pistol may provide effective!). Digital teams don’t always have the skills or resources to undertake a task successfully themselves. There are times when effort provided from beyond the host institution could be used. But how do institutions go about deciding when such approaches are appropriate? Speakers including digital team managers, vendors, and consultants will give their thoughts. The session will provide plenty of time for Q&A. The plenary sessions ensure that all delegates have the opportunity to listen to, reflect on and discuss topics which are likely to be of interest to everyone. However many delegates particularly value the parallel sessions which provide opportunities not only to address specific topics of interest in more depth but also to actively participate in the sessions. This year we currently have 9 workshop sessions, which last from 16.15-17.45 on the first day and 7 master class sessions which run from 14.45-17.30 on the second day. Bookings for the event opened earlier today. So please register if you would like to attend the 22nd annual IWMW event! In particular note that there are limited number of places for the parallel sessions so we advise early bookings if you wish to be certain of booking your preferred session.